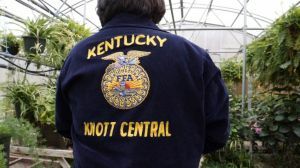 Steve Mobley the FFA Instructor at Knott County Central High School, received an Innovation Grant from KVEC as part of their project funded through the “Race to the Top” federal funding by the U.S. Department of Education. 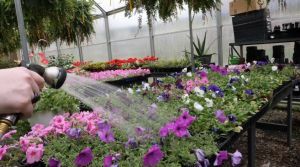 To develop an aquaponics system, the system is in place and being used. It has proven to be very successful and the students take great pride being able to help contribute! The students feel that there is a market for high-quality Koi in the landscaping industry throughout the United States. Koi are very popular additions to landscapes in ponds due to their beauty and hardy nature. They are very adaptable fish and will live in a wide range of environmental conditions. Future entrepreneurs can take the knowledge gained in this action research project and potentially develop their own businesses. In addition to the production of the Koi, we feel that we can improve and reduce the cost of our plant production in the greenhouse by using the Koi waste as fertilizer. If you would like for your school to be involved with FireCast or a FireCast Minisode be sure to fill out the application through the link below. This entry was published on May 17, 2018 and was updated on May 17, 2018 / Tanner Brown. Posted in ARI, firecast, Highlights, HollerVid, KVEC. Bookmark the permalink.